I used the crate method for both boys. I hadn't had a puppy in many, many years and both Wolf and Taylor came into the house already housebroken. Until they could be trusted, the boys were crated overnight and at anytime they were unsupervised. This meant that they didn't like to poop or pee where they slept and learned self control. I use inexpensive bathmats as crate bedding which is easily washable. I also had a supply of these bathmats which meant they could be changed 3 or more times a day before a load of laundry was necessary. (I also use a bathmat under the waterjug in the kitchen as both dogs are water dogs and occasionally as pups splash in the water). Sebastian is fastidious and early on did not pee or poop in his crate. Cinnabar is not as fastidious and stopped pooping in the crate before he stopped peeing in the crate, but I did puppy laundry for Cinnabar longer than I did for Sebastian. I took Sebastian out for frequent pee breaks when he was little. However, I made a mistake early on and used puppy pads near the back door. Because Sebastian was silent about his need and didn't sniff around giving me a hint, he just went to the back door and peed or pooped. Because of my mistake, it took almost 7 months for full potty training to be completed. With Cinnabar, he had the example of Sebastian to see and major potty training was complete around 4 months. Cinnabar gives the classic signs of sniffing and circling, so when I see that I call "outside" and he runs to the door to go out. Sometimes he's already gotten into poop pose and I've called "outside" and he's waddled to the door, bless his heart. When there are accidents that I haven't witnessed, I just clean them up and say nothing. Correction must be instant to the offense or it's meaningless. When I see an accident in progress, I call "outside" in a happy voice, clapping my hands and opening the door. I have bells hung on the back door doorknob. Sebastian rings these to go out. As of this writing, sometimes Cinnabar does as well. When I want the boys to come in, often just hearing the bells brings them on the run, other times I ring the bells and then they're on the run to the door. I started with the bells because Sebastian is silent about needing to go out, and I could never hear him looking out the door earnestly waiting for me to open it. The downside of the bells, is that Sebastian uses them to get Cinnabar's attention and presence. Once he's accomplished that, he runs and gets the toy or bone that Cinnabar had been working on. It's not a foolproof system for me at this point. I can't recommend this highly enough for puppy socialization with other dogs, other people and human learning. Not only that, you get group sympathy for the trials of puppyhood. As soon as I got Cinnabar, I started calling him by name and when he came praised him effusively. I always call their names in a "happy voice". When little I did this constantly. As there was no 'hiding' from either of them (velcro boys), I would hide best I could once they found something of interest and call their name, and praise like crazy when they bounded to me. Cinnabar has been great on recall since 2 1/2 months. I started later with Sebastian, but he's been great on recall since 3 1/2 months. I started with the "No" command early with both boys. Sometimes with Sebastian I would growl "no" at him, and would also have to show my teeth to get compliance. He would be talky back to me but comply. A sharp "no" for Cinnabar stops him in his tracks. If I growl "no" at him, he rolls on his back waving a paw, so there has never been a need for me to show my teeth to him. Formal Basic Obedience was a must for Sebastian and for me. We went through it twice and I can't be any happier about it. Our first Basic Obedience Journals are here and our Basic Obedience Up A Notch is here. I had already begun the Sit and Down command with him prior to Basic Obedience, but we learned Sit/Stay, Sit/Wait, Down/Stay, LeaveIt, Off, DropIt, walking on leash and "Place". We do Sit/Stays and Down/Stays daily, only a few minutes each day. For Sebastian it is completely old hat at this point. I can put him in a Sit/Stay and walk 60 feet away from him holding a treat, offered to him in my outstretched hand. He will not break it until I say "ok". I correct him from any "popping up" attempts by saying "eh,eh" sharply. The same with Down/Stay for him. Sometimes instead of "ok" to release him from the command, I call "Place" (he runs to my right, circles behind me and sits at my left side), a command he loves. I started Sit/Stay early with Cinnabar and he's very good at it, eyes on the proffered treat. However, because both boys are there, I cannot at this point walk away from Cinnabar. He scoots towards me eyes on the treat afraid he will miss out because Sebastian will grab it. Once we start Basic Obedience, and the blasted humidty breaks for good this season for daily walking, I can work on that with him without Sebastian's presence. Getting Cinnabar all the way down for a Down/Stay is still a challenge at this point, but he's getting it, and sometimes imitates Sebastian's 'dive' on the Down/Stay command. He will stay in a Down, but again only with me right next to him. When play gets too rough between them, I often call "Time Out" and get the can of liver treats and call Sit/Stay. I keep them in that for a minute. Then the same with Down/Stay. Then I alternate for various times, ending in a "Place" for Sebastian. Their rough play concentration is then totally broken, and they go back to jaw wrestling with a fun attitude. I use this command before every door we encounter and release with "ok" as I open and enter the door. Sebastian is very good with this command, Cinnabar is learning. I use the "settle" command when jaw wrestling and other play gets out of hand for in the house. I reinforce it with vinegar spray. Sometimes it seems to be worth it to be sprayed in the face a few times before complying. Sebastian learned this command quickly. At about 7 months old he started to want to take a toy on every trip outside. I called "DropIt" and he would, but then grabbed it quickly and tried to make a dash to the door. I wouldn't let him, so he took his toy and ran back to the family room. This clash of wills went on for a full 6 weeks, several times each day before he complied (he figured I wasn't giving up) and always dropped his toy before going out. However, every few months he tests it again to make sure I mean it. It makes no sense to him, as he does have toys outside. He will never realize that outside toys can take the weather and inside toys can't and that I don't have a printing press for money, so my rules don't make sense to him. He figures he's going to test me every now and again to make sure I still mean it. Off is the command that means all 4 feet on the ground, and I use when they try to get on furniture or put a paw on furniture. This is also reinforced with the vinegar spray. Sometimes it is worth 3 sprays before complying, sometimes compliance is instant, but I am always constant in these rules. They are big dogs and must be well mannered. This is also the command for countermanding jumping on people. If they are leashed with their gentle leader, it is given the same time a downward tug on the leash is applied (which pulls their head down). I lower my voice when issuing the commands, as this is more effective with them. I issue the commands sharply, as playfully rarely produces results. I use an edge to my voice when sudden canine deafness occurs. I use a sharp "excuse me" for bad behavior, which gets their attention. I use "eh,eh", sometimes "eh,eh,Eh,Eh,EH,EH" to get attention and stop bad behavior. Our trainer and I joke that sometimes no English is spoken in a house with a puppy as you're always correcting behavior. I use lots of praise with a happy voice for good behavior. Sometimes I realize I'm being too skimpy with it and then really lavish it. After all, we've worked so hard, I can't take that good behavior for granted. They really soak it up and give me the "airplane" ears and tail wag when they hear it. 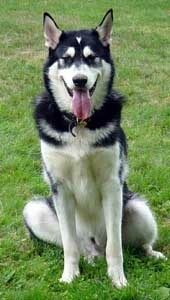 I can't emphasize how important basic obedience is for a 125lb Alaskan Malamute. I can take Sebastian into pet stores and have only good behavior the whole way, including Sit/Stay at the checkout. I can take him into the bank and have him well behaved. I can take him into the UPS store, where there are lots of people, copiers going and other machine noises and have him well behaved. Only working with him daily has made that possible, and it doesn't mean he's perfect, he's still learning and still a handful, but we have a base of good behavior. I realized how much progress we made one day at the pet store. A teenage boy pointed to Sebastian and said to his father, "that's an obedience trained dog, I want one like that". Wow! They approached gently and asked to pet Sebastian and when I agreed, Sebastian was perfectly behaved. (Not like the seemingly swarms of kids that see him and run at us screaming "can I pet your dog? ", when the answer is always no with me holding up my hand in a "talk to the hand" gesture to stop their forward movement, which seems like an attack to a dog). But, that young man's voice will always be in my head, "that's an obedience trained dog, I want one like that". He saw a 31+" dog (who I think happens to be gorgeous), walking at my side listening to me and wanted one like that. The hard work is worth it. 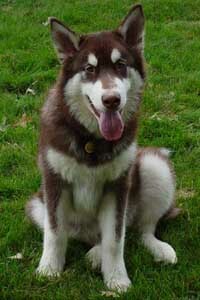 Sebastian and Cinnabar are becoming ambassadors for the Alaskan Malamute breed. Sebastian and Cinnabar attend Day Care once a week at Happy Tails. This reinforces their socialization with other dogs in play groups, and with other people. It also keeps them in the good habit of taking commands from other people. We're going to the pet store and other places at least twice a week. Although initially scared of the pet store, Cinnabar is over that. He's completely gregarious with meeting people, which is wonderful. Sebastian is gregarious with women, but takes quite awhile to warm up to some men. I've discerned no pattern with his selection. Since I want to get Canine Good Citizenship certification for both of them, they need to be gregarious with everyone when we're out in public. That's why we go out and about at least twice a week. 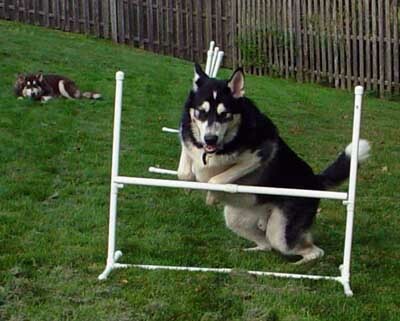 Good Basic Obedience has also proven extremely helpful going through Agility Training. My ability to put Sebastian in a Sit/Wait prior to an obstacle is mandatory. In my mind, all other training is only based on good Basic Obedience. 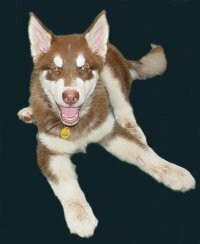 MALAMUTE MEMORIES by Dr. Ian Dunbar. This article was based on Dr. Dunbar's monthly Behavior column in the November 1988 issue of The American Kennel Gazette. Excellent article!